There’s a line in an episode of Breaking Bad where a character says to another, “Just because you shot Jesse James, don’t make you Jesse James”. Truer words have never been spoken concerning Wally Pfister who, after years of serving as Christopher Nolan’s cinematographer, has been promoted to the director’s chair for sci-fi thriller Transcendence. Just because you shot for Christopher Nolan, don’t make you Christopher Nolan. Pfister here tries his hardest to replicate the Inception director’s style, use of ensemble cast, and juggling of complex ideas within our modern day society. But so rarely does it manage to work in the final product, which comes off as a pale imitation of a much more competent director. His sense of pacing, for instance, is appropriately amateur – this is the sort of film that begins AFTER the climax has happened with everything else being told in flashback, which immediately kills all suspension and mystery the rest of the film tries to build – and his attempts at displaying social commentary backfire once it delves into pure science-fiction territory. To be fair to Pfister, the script is terribly written – with all due respect to debuting writer Jack Paglan, it feels as if he makes stuff up as he goes. For instance, the bullet that an anti-technology assassin tries to kill Johnny Depp’s scientist with is laced with radiation which gives him a slower, quicker death and thus sets the rest of the events in motion; if he wanted to kill Depp then why not use an actual bullet to the head or heart? It would make no difference and it would actually kill him faster. Later, that same anti-technology terrorist group (led by Kate Mara, who is bizarrely introduced as her normal brunette self but then inexplicably dons a platinum blonde wig for the rest of the film) are actually seen using laptops and highly-sophisticated tracking devices, defeating their entire functioning purpose. Its plot-holes like these that continue to distract us from the storytelling, which neither writer nor director is able to grasp wholeheartedly. Paglan’s lack of character development is another major flaw that Pfister can’t be able to fix for its actors to properly portray. Depp, continuing his recent run of bad luck after last year’s bomb The Lone Ranger, literally phones it in as a scientist who even seems disinterested in what he himself is saying, while Rebecca Hall is saddled with an increasingly-unlikable part who seems to get dumb and dumber with every passing moment her character manoeuvres about. Completely wasted as pointless additions are the likes of Morgan Freeman and Cillian Murphy, who do absolutely nothing that benefit the overall plot and more than often take a backseat to whatever Depp is doing. Mara has nothing to work with, as does Paul Bettany as the true heroic character who never seems to catch a break. It doesn’t help that most of these characters are very stupid, Hall’s especially, and thoroughly unlikable for us to follow for the rest of the film. There are moments that do go into unintentionally-funny territory, particularly in its second half where it turns out that the DEPP 9000 (obviously not its real name, but what else are you going to call a computerized Captain Jack Sparrow?) can heal people, repair items, grow plant life, control them to do its bidding, give them his own voice, and basically anything that would be pretty farfetched for even a supercomputer to pull off in real life. Watching these things play out on screen, and being forced to take it all seriously, makes it very difficult not to at least crack a smile. There’s no doubt that Pfister and everyone else who worked on this film meant well, but Transcendence is still a colossal failure even by imitation standards. Once again: just because you shot for Christopher Nolan, don’t make you Christopher Nolan. 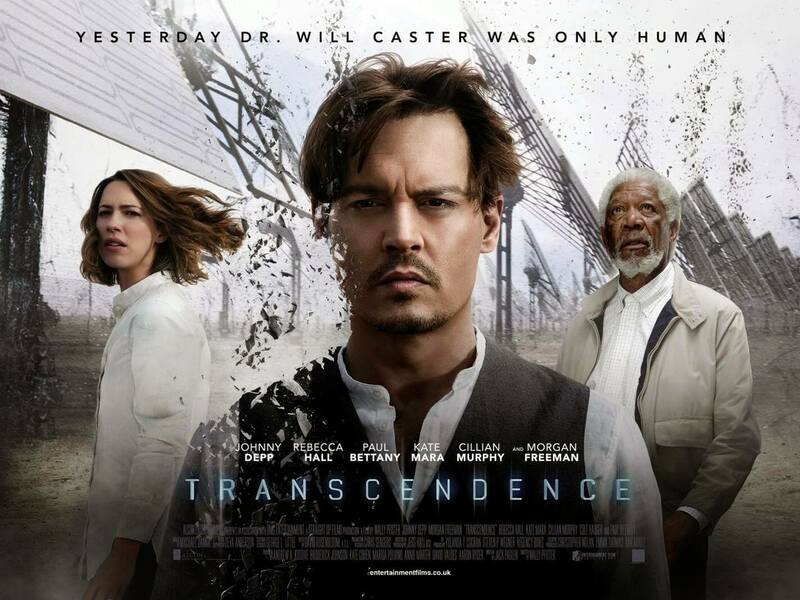 Transcendence is wonky sci-fi at its most awkward, with a dreadful script filled with plot-holes and dumb characters partnered with a lacklustre sense of direction by a debuting director. We’d say “better luck next time”, but seeing how badly it’s already gone over I wouldn’t bet on Pfister getting another chance for a good long while.